Earth and Sky is an extraordinary metaphysical tour exploring the most powerful sacred sites in Scotland. This is not a tour to see the sights. This is a journey to reach the heights – and the depths – of what souls in bodies can experience. This is inspirational hands-on magic which can alter the course of your life. 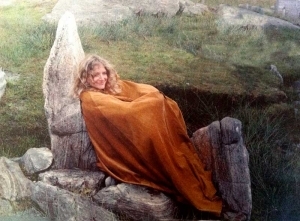 If you have a strong connection with Scotland and with Celtic Magic, and desire to bring your spirit and body into harmony and union, this is a trip you cannot afford to miss. On this tour we will do magic to unite the expansive visionary qualities of the starry sky with the nurturing energies of the earth. The Place: Our journey will take us to the standing stone circles in the Orkneys and to Callanish in the outer Hebrides, concluding with the isle of Iona and its powerful healing energy. Cerridwen is an experienced shaman devoted to synthesizing the best of the old ways with the new age, creating magic, ritual and relationships that work. She is a professional psychic and spiritual teacher who is adept at creating sacred space–within the stone circles, and within the circle of each participant’s heart. She is the author of The Heart of the Fire, a past-life novel about Witchcraft set 16th century Scotland., and White as Bone, Red as Blood, her newest past-life novel set in 12th century Japan. With 30 years of experience as a shamanic Wiccan Priestess, Cerridwen is an ideal guide for renewing our connection with the Earth mysteries so vital for personal and planetary healing. Cerridwen will create rituals to facilitate the reunion of earth and sky,male and female, past and future, inner and outer, Goddess and God.